Key developments in Africa during the week of March 24th include the high level of civilian targeting in the Anglophone regions of Cameroon and around the Lake Chad; the localised tensions in the DRC despite an overall reduction in conflict activity in the post-elections period; the threats posed by Al Shabaab in Somalia; and the many attacks against CNL supporters in Burundi. Violence in March in Cameroon has reached its second highest levels in the ACLED dataset, due to the sustained violence in the Anglophone regions and the rise in Boko Haram activity in the Extreme-Nord region. In the Anglophone regions, violent events associated with the conflict between Ambazonian separatists and the government have maintained steady, reduced levels since the peaks of September and October 2018, which surrounded the one-year anniversary of the separatists’ declaration of independence. However, the current conflict patterns show a significant rise in the frequency and lethality of Violence Against Civilians (VAC) by both sides. Half of the records of VAC so far in March are due to the launch of new security operations by the state forces mid-March in the Nord-Ouest. The operations have involved the raiding of nearly a dozen villages and the killing of 27 civilians between March 14-28th. Two such operations were conducted last week, on March 26th, in the towns of Wum and Widikum in Menchum and Momo departments respectively, leaving a reported 11 people dead. The majority of the remaining VAC events in the Anglophone regions are abductions by the separatists and unknown gunmen. These trends suggest a dangerous future for Anglophone Cameroonians. The rising Boko Haram activity in the Extreme-Nord region adds another layer to the instability in Cameroon. 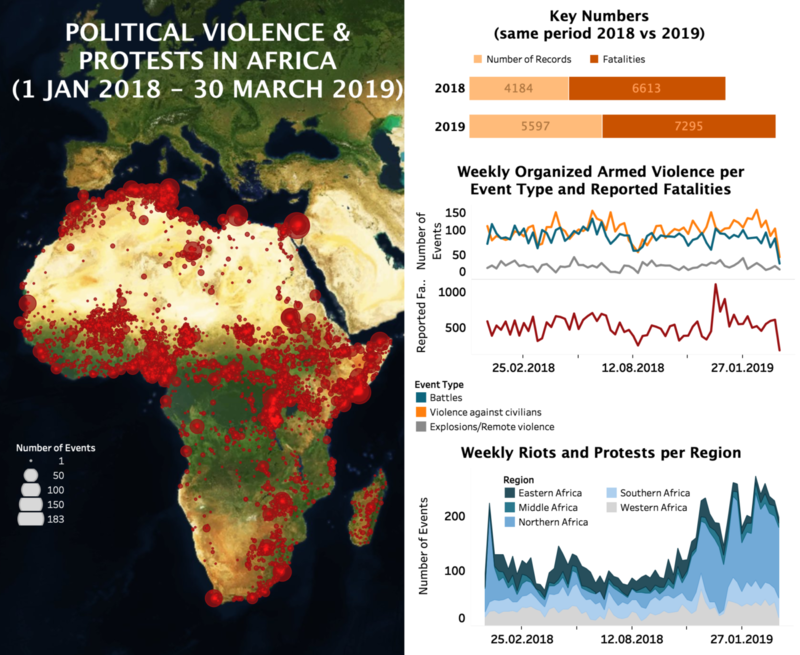 Boko Haram-related violence levels are higher in March 2019 in Cameroon than during the previous seven months, while VAC perpetrated by the group in March is at record highs in the ACLED dataset. The quick rise in the targeting of civilians by the militants in the Lake Chad area in Logone-et-Chari department is of particular concern. These developments are part of a wider trend of increased activity by Boko Haram (including IS-aligned Boko Haram militants) along the Cameroonian, Nigerien and Chadian shores of the Lake Chad. The developments in Niger’s Diffa region last week further illustrate this trend. On March 26th, a Boko Haram attack on N’Guigmi town, which involved two suicide bombers and burning of houses, left at least 12 people killed; this is the most lethal attack against civilians perpetrated by the group in Niger to date. The recent reports of clashes between different Boko Haram factions (aligned with Shekau or with the Islamic-State) along the Niger/Nigeria border could be one factor driving the levels of violence up in the Lake Chad area. There were other relevant developments last week spanning the DRC, Somalia and Burundi. In the Democratic Republic of Congo (DRC), the conflict levels continue to decrease in the post-election period. Localised tensions persist in Nord-Kivu, however: in the Masisi territory, fighting continues between the Nduma Defence of Congo (Renewal) and an alliance of the Mayi Mayi Nyatura and Alliance of Patriots for a Free and Sovereign Congo (APCLS); in the Beni territory, the Allied Democratic Forces (ADF) also continue to clash with the government forces. Unusual tensions also rose further south, near Lubumbashi, as gunmen attacked truck drivers crossing the border between Zambia and the DRC, prompting a three-day protest and blockade by the truck drivers on the Zambian side of the border. In Somalia, Al Shabaab appears to have been weakened by the reinforcing of the counter-insurgency operations since the beginning of year. However, the militants remain a key threat. In the Banadir region, Al-Shabaab targets government officials and forces in large cities and towns like Mogadishu, Hodan, Hawl Wadaag and Waridghley on a daily basis, mostly with VBIEDs and grenades. Last week, on March 28th, a series of Al Shabaab explosions in Mogadishu left a reported 15 people killed. There is also a risk that the militants launch new attacks in the Shabelle and Gedo regions in the coming weeks. The militants have recently taken over several bases vacated by the military and AMISOM forces in these regions as part of the ongoing soldiers’ strike over lack of salary payment and the withdrawal of Kenyan AMISOM troops. Lastly, in Burundi, one month after the closure of the UN Human Rights Office over government demands, the daily reports of attacks and abuses against civilians continue. The bulk of the attacks are perpetrated by police and members of the ruling National Council for the Defence of Democracy’s youth wing, the Imbonerakure, against opposition party representatives. In March, 19 attacks were perpetrated against supporters of the newly formed National Congress for Liberation (CNL) in various areas, mostly by Imbonerakure militias. Last week, on March 25th, one CNL supporter was killed in Sigu, Kirundo province. The CNL was formed by Agathon Rwasa, a former member of the Amizero y’Abarundi coalition, after the May 2018 Constitution forbade independent coalitions from running in elections. Although the Parliament’s recognition of the new party was welcomed by the opposition, the CNL and other opposition groups will likely face further constraints ahead of the 2020 elections.